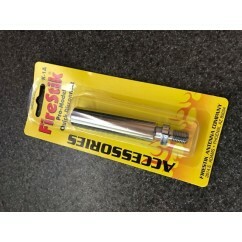 This is the latest generation "FireFly" antenna from Firestik - complete with a tuneable tip. 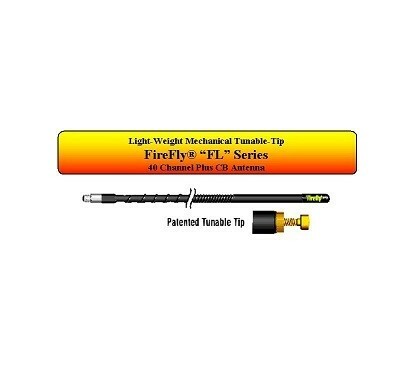 All of our CB Antenna kits utilize the FireFly antenna because we believe that it is one of the best antennas on the market. If you should break your antenna, or if you just want another one for a different installation, you can order it here. The "FL" Series antennas are the performance leader of lightweight top-loaded CB antennas. Each is approximately 40% lighter than the equivalent length Firestik II antenna. From the perspective of mount stress, the lighter materials and reduced wind drag of the "FL" antennas reduces stress by more than 60%. A 4-foot FireFly will easily perform on a mount that is designed for antennas 3-foot or less. At the top of every "FL" antenna you will find our patented tunable-tip. Besides making tuning a snap, the design broadens the antennas bandwidth and increases its power handling capabilities. All "FL" antennas are compatible with autos, trucks, vans, motorcycles and ATV's in a single antenna configuration when metallic ground plane is available. Or, they may be used in dual (co-phased) configuration on any vehicle made from any type of material. Like all CB antennas, the "FL" antennas should be fine-tuned (SWR) in their final mounting location. If you have ever tuned a non-tunable tip antenna, you will have a real appreciation for the "FL" antennas. In short, tuning is as easy as popping off the tip and turning the adjustment screw up or down as needed. All "FL" antennas exceed the requirements of any CB radio, new or old. Aside from the hi-performance loading coil that maximizes the transmit/receive functions of your CB, these top-loaded antennas will also receive the NOAA emergency weather alert and national weather broadcasts for radios with those features. All "FL" antennas are 100% American made with 100% American materials. To maintain a balance between flexibility and ruggedness, we use a custom blended, glass fiber reinforced tube. Each is wound with double insulated copper wire to prevent the oxidation and shorted windings often found on non-Firestik antennas. The tunable tip mechanism is made from rust-proof brass and has a rubber o-ring to hold the adjuster in place after tuning. Our 3/8"-24 threaded base will fit all Firestik mounts and accessories. Each antenna is covered with a static reducing, water-tight sleeve containing UV and pigment stabilizers. All "FL" series antennas are factory bench tested for resonant frequency and overall quality. They are available in black or red with a black tip. The Replacement FireFly Antenna is in stock. Shipping Information: The Replacement FireFly Antenna ships via FedEx Ground. Email sales@cooltechllc.com for international or express shipping inquiries.